Download the data sheet for more validation data and applications. 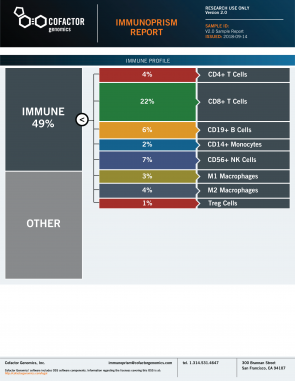 Cofactor ImmunoPrism provides comprehensive, quantitative immune profiling from only 2 sections of solid tumor FFPE tissue. ImmunoPrism is now commercially available. ImmunoPrism shows high concordance with flow cytometry when analyzing immune cells from PBMC samples, and accommodates degraded samples from FFPE. See more results when you download our data and applications sheet (above). Save Time. Save Money. Save Samples.